A bear goes over the mountain to see what he can see, hear what he can hear, smell what he can smell, touch what he can touch, and taste what he can taste; what a busy bear! When he sets out on a sunny morning in spring he uses all five of his senses to explore the world around him. He smells a skunk (yuck!) and sweet honeysuckle vines (yum!). He sees dragonflies and fuzzy ducklings, he hears crickets chirping, he touches a soft flower blossom, and more! When the chill of autumn comes creeping up over the mountain, he goes back to his cave for a snuggly sleep. With warm, beautiful watercolors and playful, evocative words, Iza Trapani extends this classic children’s song to teach young children about the five senses and the four seasons. It’s so much fun that kids will want to go out exploring, just like the bear! 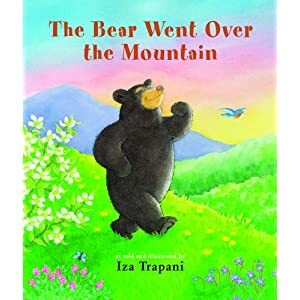 Iza Trapani is a bestselling children’s book author and illustrator known for her popular extensions of nursery rhymes. Iza’sretelling of The Itsy Bitsy Spider has sold over a million copies and all her books are widely used in the United States and abroad. Among her awards are the IRA/CBC Children’s Choices, Oppenheim Toy Portfolio Gold Book Awards, ABA Pick of the Lists, and Bank Street College of Education Best Books. When she’s not in her studio, Iza likes to spend time outdoors and has gone over many mountains to see what she could see. Iza lives near Kingston, New York. Filled with beautiful illustrations and a wonderful story line you will be transported to a fun world that you can share with your child over and over again. The other nice things about this book is that if you know the song that follows this story you can sing the story and even if you do not, you can read it too. The story is fun and the illustrations just jump off the page. This is a wonderful book for the whole family! Thank you so much for the lovely review! I am so happy you like it! Airbake Baking Sheets are Amazing for any Baker! Book Review - Hop, Skip and Jump, Maisy! Book Review - Let's Have a Tree Party! Book Review - What is that Boy Going to Do Next? Game Review - Spot It! Pound Puppies on DVD Today! Muppets Parody The Hunger Games!